"PILAU" hostel on Rubinshteyna Street located in the historical centre of Saint Petersburg 5 minutes walk from Nevskiy Prospect, the main avenue of Saint Petersburg, and 2 minutes walk from the Dostoevskay / Vladimirskaya metro station. You can get to us from Moscow Train Station by metro (just one stop) or 15 minutes walk. You can also take one metro stop from Vitebskiy Train Station or 10 minutes walk. Important cultural and historical places of interest such as Kazan Cathedral, the State Hermitage Museum, Dvortzovaya Square ( where main city celebrations take place), Church of the Saviour on the Spilled Blood, the Summer Garden, Mikhailovsky (An Engineer) Castle, the State Russian Museum, the Admiralty, St. Isaac's Cathedral and others are all within walking distance. 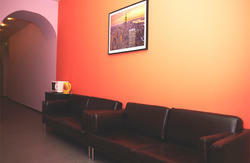 We offer comfortable accommodation in 2-, 4-, 6- or 8-bedded rooms. A toilet and shower are in a room or conveniently located on each floor. Three of our NEW 4-bedded rooms with TV have lower beds with 140x200 mattress (rooms can be booked for 5 or 6 persons). We also have one room with a double bed. In spite of the fact that some rooms have their toilets outside, on each floor, nobody experience discomfort about that, because we have 7 showers, 8 toilets and 12 washbasins, all brand new, for just 48 people staying with us. The optimal combination of price, quality and high standards of service and flexible approach to the system of prices and discounts - the calling card of "PILAU" hostel. By public transport take bus or mini-bus ("marshrytka"), or take a taxi, to Moscovskaya metro station. 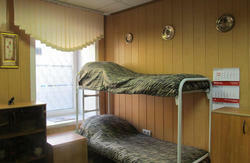 Then take the METRO train to the Vladimirskaya / Dostoevskaya metro station and then WALK TO THE HOSTEL . About 15 minutes walk from Moscow Railway Station to the PILAU or take a train from the Ploshad Vosstanya/Mayakovskaya METRO station to Vladimirskaya/Dostoevskaya metro Then WALK TO THE HOSTEL . Vitebskiy Train Station from the Pushkinskaya METRO station take a train to Vladimirskaya/Dostoevskaya metro. Then get to the WALK TO THE HOSTEL .